Annual Rotary Dinner Auction at the Walker House in support of the Southampton Rotary’s Pledge of $20,000 to the Regional MRI Initiative for the Saugeen Memorial Hospital Foundation and other Rotary causes. Auction items courtesy of Sisters On Huron, Southampton Olive Oil Company Lighthouse Photo Gallery, Square Deal Neil’s, Getaway Weekend, Hotel and Dinner Cruise package, Tour of Parliament and Hotel package in Ottawa, and many more…! All Southampton BIA members are invited to attend the 2018 Annual General Meeting and Election of a New Board of Management from 6:30pm – 9:00pm at the Walker House. If you are able to attend please RSVP to southamptonbia@gmail.com. Members must be in attendance to cast their vote in the election of a New Board of Management. The Meeting Agenda and 2019 proposed budget will be available on the Southampton BIA website homepage ahead of November 6th, 2018. Let’s celebrate the season together! 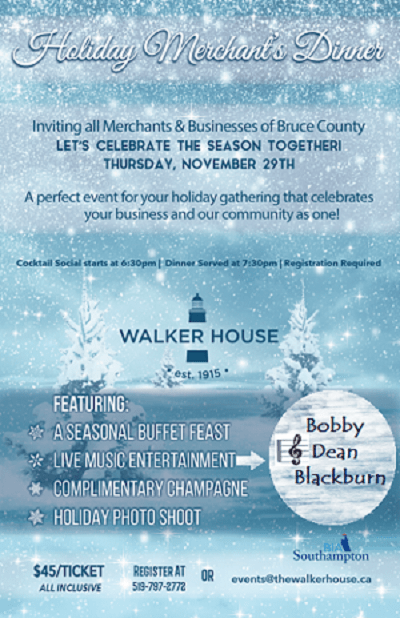 Join us for our 4th annual Walker House Holiday Merchant’s Dinner. A perfect event for your holiday gathering that celebrates your business and our community as one! Open 11:30 am to 6:00 pm on Christmas Eve! Merry Christmas! 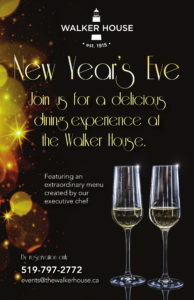 Join us for a delicious dining experience at the Walker House. Featuring an extraordinary menu created by our executive chef. By reservation only, call 519-797-2772.